Health Check: can I exercise while getting over a bug? As we move into winter, the cold mornings, dark evenings and rain tend to bring out the best excuses to miss a session at the gym or run around the park. But if you’re feeling tired and run down, can exercise actually make you sick? And should you wait until you’ve completely recovered before putting those runners back on? Like many things in life, moderation and common sense are key. If your symptoms are above the neck – a runny nose, nasal congestion and a sore throat – you’ll still be able to manage a workout, though at a lighter-than-normal level. The human body is constantly under attack from bacteria, viruses and fungi that encourage an infection. The common cold is the most common type of infection worldwide, with most adults succumbing to at least two to three colds a year. Thankfully, most people’s immune system helps to protect them. 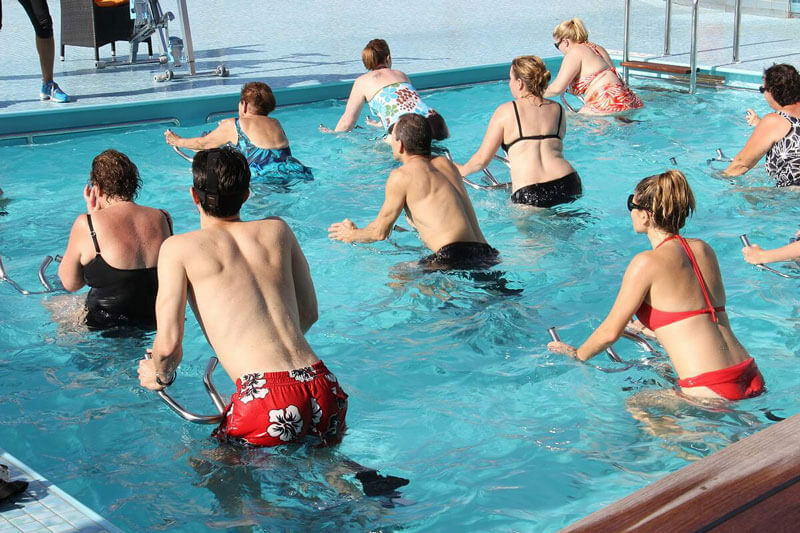 But exercise can both help and hinder our immune system. People who perform moderate exercise regularly catch fewer colds than those who are either inactive or perform high-intensity or long-duration exercise. So, a little bit of exercise is good, but too much may be bad. Simply speaking, the body’s response to a one-off workout is similar to being injured or fighting off an infection. Inflammation increases the blood levels of different parts of the immune system, providing us with a positive “boost” to help restore the body back to its normal state. This boost doesn’t last much longer than a few hours before returning to pre-exercise levels. But when repeated regularly, and with sufficient rest in between, each bout of exercise improves immune function that accumulatively leads to a 20-60% reduced risk of infection. In contrast, athletes and heavy trainers who regularly perform either very intense and/or long-duration exercise are two- to six-times more likely to get sore throats and flu-like symptoms than the rest of the population. This is most likely caused by the exercise also triggering “stress hormones”. Using the inflammation analogy above, imagine you were constantly injured; this depresses some of the many functions of our immune system and thereby limits recovery back to normal. What else I should know? It’s not all about the exercise. Many of the accompanying behaviours associated with people being moderately or highly active could also explain some of the changes. Those training too much, including athletes, might not be taking enough care of their diet, or could be suffering from impaired sleep or encountering raised levels of mental stress. At the other end of the scale, those beginning an exercise regime might be making positive changes to all the above. Diet, sleep, mental stress, poor hygiene and contact with other infected people (large crowds, mass transport such as planes, trains and buses) are all known to influence immune function. While you may have seen adverts claiming that supplement X can improve your immune function and protect against infection (think probiotics, green tea or berry extract), none appear to provide the same benefit as a healthy, well-fed and active individual. However, something you can do is keep well-hydrated during your workout. If that comes through the use of a sports drink, it may not be a bad thing – taking in some carbohydrate doesn’t only keep your blood sugar steady, it also lowers the stress hormone response that could take theedge off any immune function depression during recovery from exercise. The good news is that no matter whether younger or older, male or female, or the type of activity you do (gym, aqua-aerobics, playing a sport, gardening, dog-walking, being intimate with your partner, and so on), at least 20 minutes of something that gets you breathing harder and your heart beating faster should provide the same benefit. Although most of the research conducted and guidelines tend to promote cardio exercise, the limited research looking at lifting weights (resistance exercise) suggests a similar benefit to immune function and therefore reduced risk of infection. When should I not exercise? Well, you should probably swap your training for some R&R if your symptoms are below the neck (chest congestion, cough, stomach problems such as vomiting or diarrhoea) or you have a fever, muscle aches or widespread fatigue. Similarly, if symptoms get worse with exercise, stop and rest, and if they continue beyond a few days, make an appointment with a doctor. Remember, you can always restart your routine gradually when you’re feeling better. 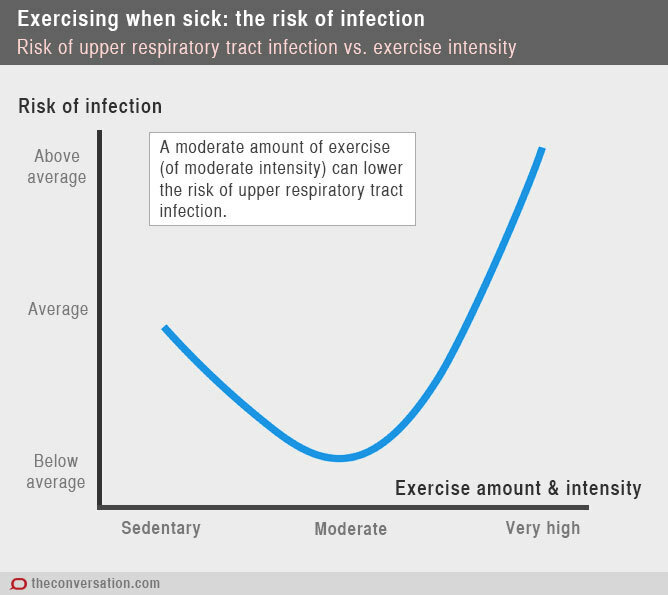 Where exercise is concerned, if you want to prevent infections it’s better to be fitter and exercise most days of the week, while making sure you rest and recuperate sufficiently. As long as you only have mild symptoms above the neck (runny nose, nasal congestion or sore throat), there’s no need for these to be your excuse from meeting up with your friends at the gym. But don’t think that your workout alone equals a healthy lifestyle. Don’t neglect a varied and balanced diet, good sleep and hygiene habits, and your psychological and social well-being.